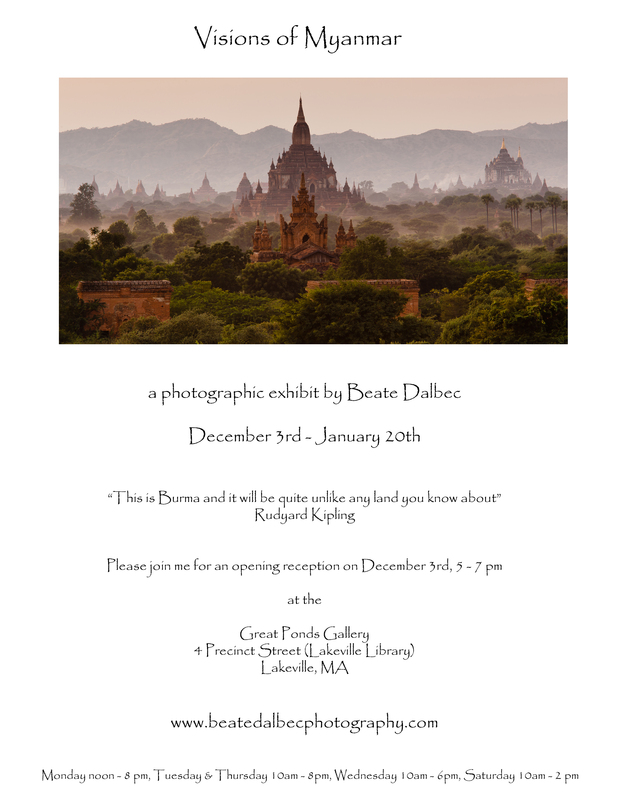 I am very happy to announce that I will have an exhibit of some of my Myanmar images at the Great Ponds Gallery in Lakeville, MA, lasting from December 3rd until January 20th. A public opening reception will be held on December 3rd, 2013, from 5 until 7 pm. Once known as the Pearl of Asia, Myanmar is a country full of stunning historic sites and inhabited by friendly and welcoming people. Their strong traditions and culture, which are deeply rooted in Theravada Buddhism, combined with their isolation from Western influences over the past fifty years, make a visit to Myanmar like traveling back in time (you can take a look at a short slide show from my first visit here ). I have visited Myanmar, formerly known as Burma, on two occasions. My first trip was in December of 2011 and I returned for a second visit in January of 2013. My image of a young monk studying in a monastery in Yangon won the “Children of the world” medal at the Greater Lynn International Salon in 2012. If you would like to have a glimpse of what this country is like, please join me at the opening reception or stop by anytime during the regular opening hours (Monday noon – 8pm, Tuesday & Thursday 10 am – 8 pm, Wednesday 10 am – 6 pm, Saturday 10 am – 2 pm). The gallery is located at 4 Precinct Street (Lakeville Library) in Lakeville, MA.